Many of us remember playing lawn darts back in the day. While those old-fashioned lawn darts provided all sorts of family-fun entertainment, you can still almost hear those overly-cautious moms warn their children with the old standard "don't poke your eyes out" mantra. Well, move over old-fashioned lawn darts - there's a new game in town. Copter Darts, from OgoSport, are your basic lawn darts kicked up a notch or two. These darts are safer than the old standard that most of us remember. The flexible foam wings on the darts make a super spinning "OgoMotion" slowing the copter darts down causing them to "helicopter" to the target. And because the darts have a weighted plastic end, they always land upright! And playing Copter Darts couldn't be easier. Just place the target where you want, stand back, aim and throw. And don't let the rain or dreary weather get you down; this fun game can even be played indoors! 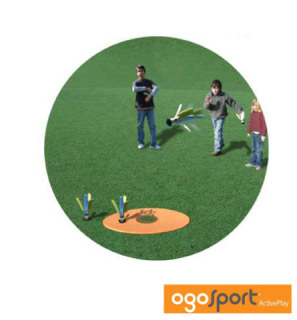 OgoSport is a company that encourages outdoor activities so whether you play alone or with a group, just play! 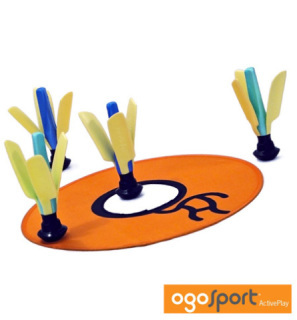 The set includes 4 EVA darts, carrying case and a flexible OgoLogo target which folds up nicely in a little pouch. Due to the fact the product includes small parts, the game is not recommended for children under 3. Copter Darts retails for about $30.